Summer started a week and a half ago for me. My last day of school was June 3rd. This is the earliest we’ve ever been out of school so I’m pretty excited to for my long summer. However, while many of my friends are relaxing and enjoying their summer, I’m still working. Once summer starts I begin putting in 6-7 hours work days into my blog. Now don’t get me wrong, writing posts, photographing, and cooking in my pajamas is pretty awesome. Plus I can work a few hours in the morning, do a few things, then work at night as well. It’s great to have flexible hours so I can enjoy my summer but I’m still busy. This means that after all the cooking, baking, and photographing for the blog I’m ready for an easy but tasty dinner. 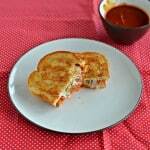 I want a great meal with high quality ingredients that I feel good about serving to my family. 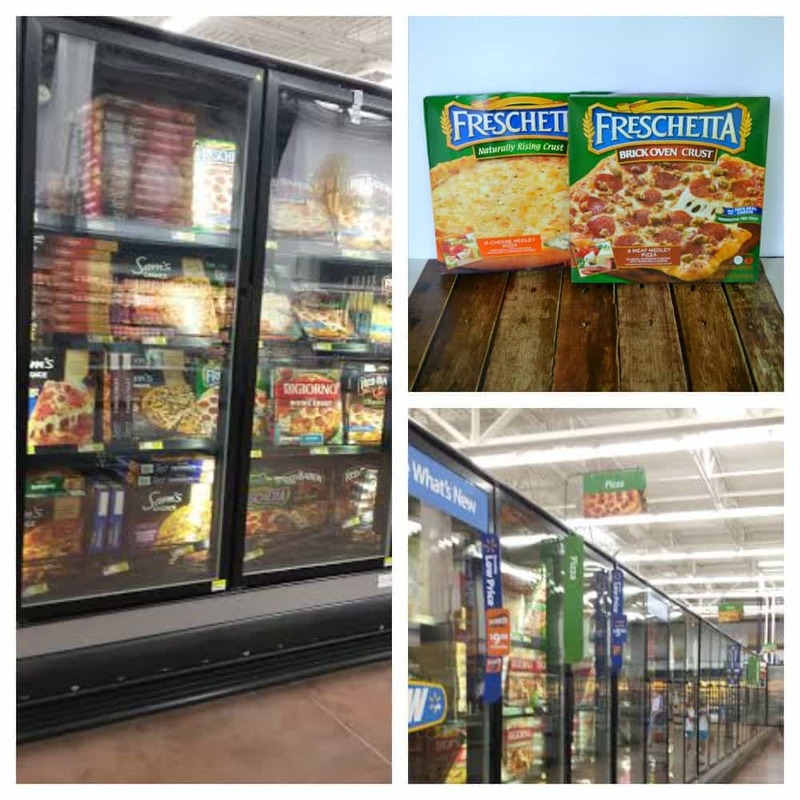 I found all that at Walmart with Freschetta Pizza. 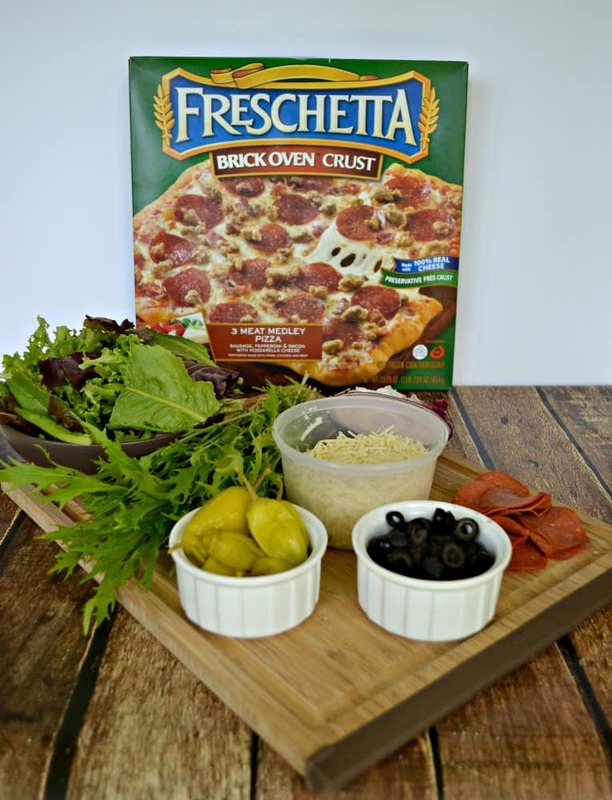 Freschetta Pizza is made with high quality ingredients, the crust has no chemical leaveners, and the sauce is made with sun-ripened tomatoes. The best part? I don’t have to make it myself! I can just pop it into the oven and in less than 20 minutes I have a great pizza that my family loves. I purchased 2 pizzas because I always like to give my family options. 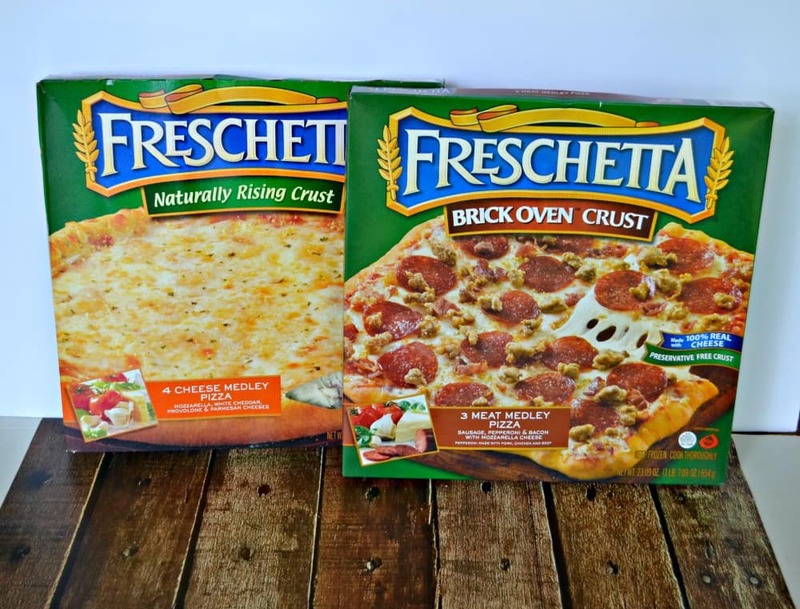 I bought the Freschetta Brick Oven 3 Meat pizza and the Freschetta 4-Cheese pizza. 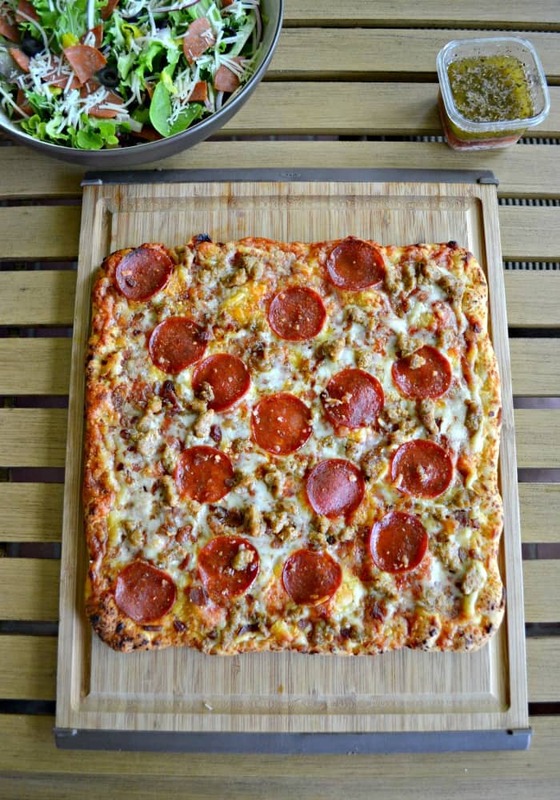 When I got home my husband chose the Freschetta Brick Oven 3 Meat pizza for dinner so I decided on a side dish that went with the pizza. We belong to a CSA (that’s community supported agriculture) and this week we got a lot of lettuce. We received a head of organic Bibb lettuce, a bag of organic mixed greens, bok choy, and organic arugula. 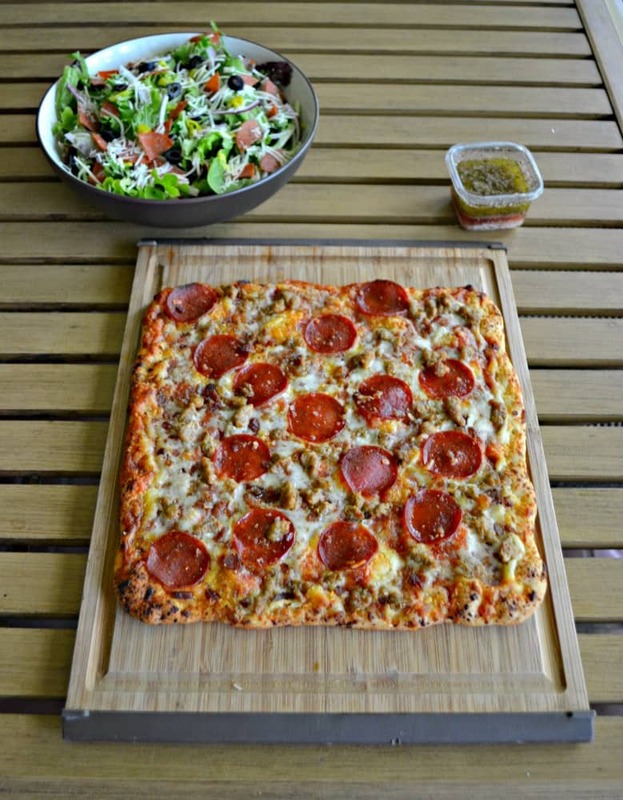 Since we had so much lettuce I wanted to make a delicious Italian Chopped Salad to pair with our 3 Meat Pizza. I took the mixed greens and arugula as the base of the salad. The mixed greens provided a sturdy base and the arugula adds a bit of spice. Sticking with the Italian theme I then added in pepperoni, pepperoncini’s, olives, red onions, and Parmesan cheese. Then I made a homemade Italian dressing to go on top. The entire meal took less then 30 minutes to make and bake. It was delicious and the ingredients were ones I trusted. The Brick Oven Pizza crust was crispy and the amount of meat on the pizza was perfectly distributed. 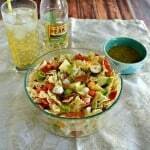 The salad was crisp, had the perfect amount of toppings, and the homemade Italian dressing had a nice tangy flavor. 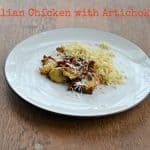 This is a great weeknight meal that the whole family will enjoy. 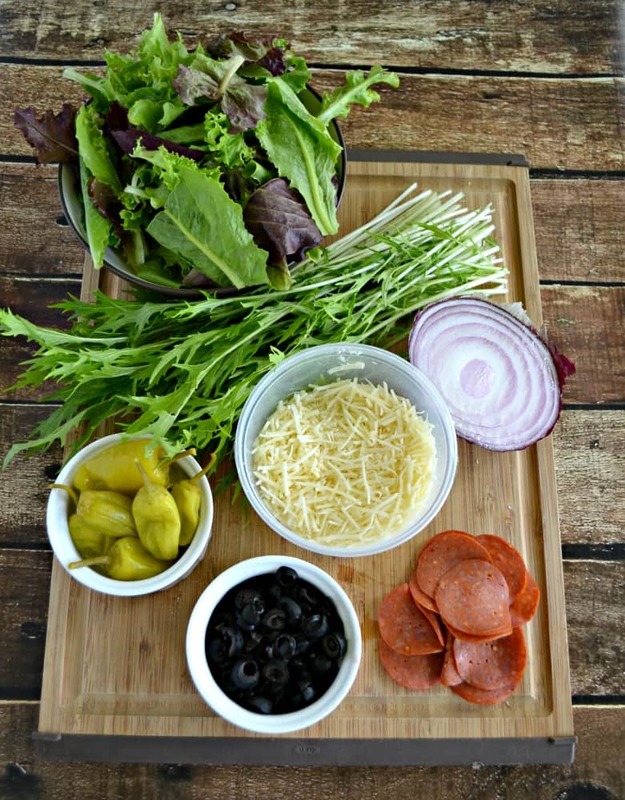 Get rid of the iceberg and make a delicious chopped salad with arugula, pepperoni, olives, Parmesan cheese, and homemade Italian Dressing. In a large bowl combine all of the salad ingredients. Toss to combine and set aside. Place all the dressing ingredients in a small bowl with a lid. Shake vigorously to combine. 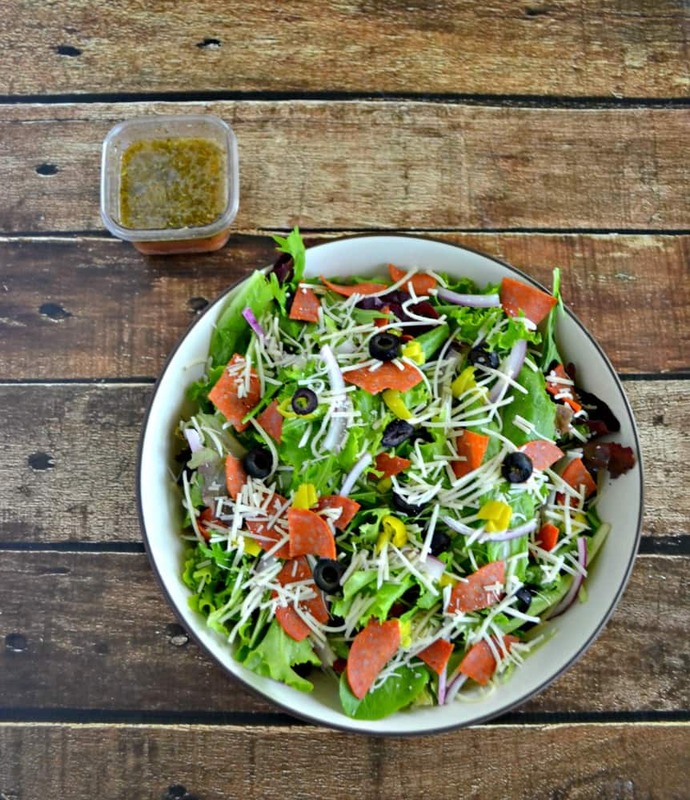 Divide the salad between 4 bowls and serve with homemade dressing and additional Parmesan cheese. 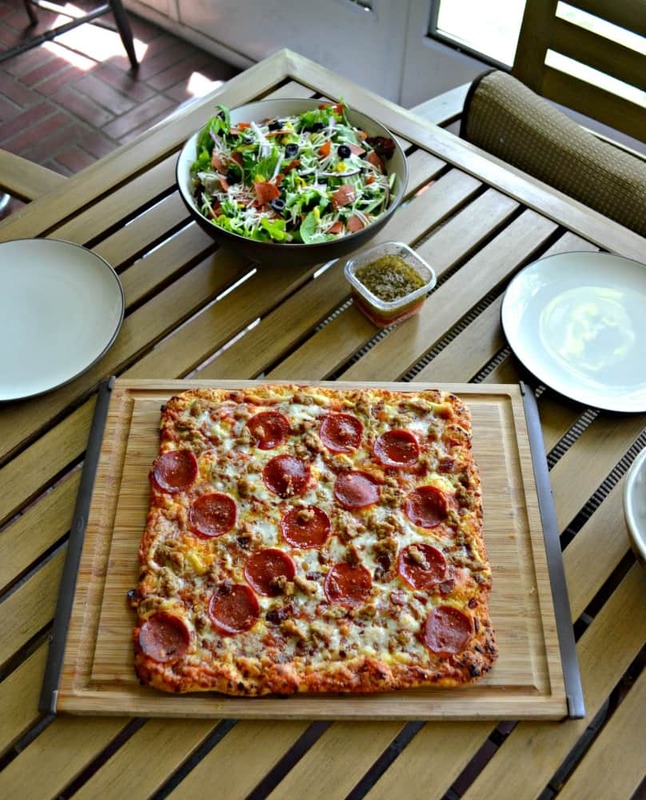 Does your family like pizza? 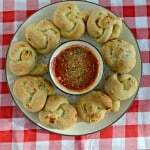 Check out the Freschetta website and let me know which flavor of pizza your family would most like to try! Freschetta is my favorite frozen pizza. It’s actually pretty tasty!